You’ve probably heard of glaucoma at some point or another. You know it has something to do with the eyes and it isn’t good to have it. You may even have a parent or grandparent that has it and know they take eye drops to treat it. But what exactly is glaucoma and who gets it? What is it? Glaucoma is a group of eye diseases that gradually damages your vision without symptoms. This vision loss is caused by damage to the optic nerve which is the cable that carries images from your eye to your brain. The most common form of glaucoma occurs because the fluid pressure inside of your eye is too high (like having too much air in a tire). This high pressure damages the optic nerve in the eye slowly causing gradual loss of vision. Who gets it? In the United States, currently 3 million people are affected by glaucoma. The most common forms of glaucoma affect the middle aged and the elderly, but it can affect people of all ages. People with the highest risk are people of African, Asian or Hispanic descent; people that have other family members with glaucoma; diabetics; and people who are highly nearsighted. How do I know if I have it? The best way to protect your sight is to get a comprehensive eye exam on a regular basis. There are no symptoms associated with glaucoma – there is no pain, no sense of high pressure in the eye, and no sense of vision loss until very late in the disease. During an eye exam, we measure your eye pressure (like measuring tire pressure) and look at your optic nerves for signs of damage. There are also special instruments we can use to catch the disease as early as possible like the OCT pictured below. 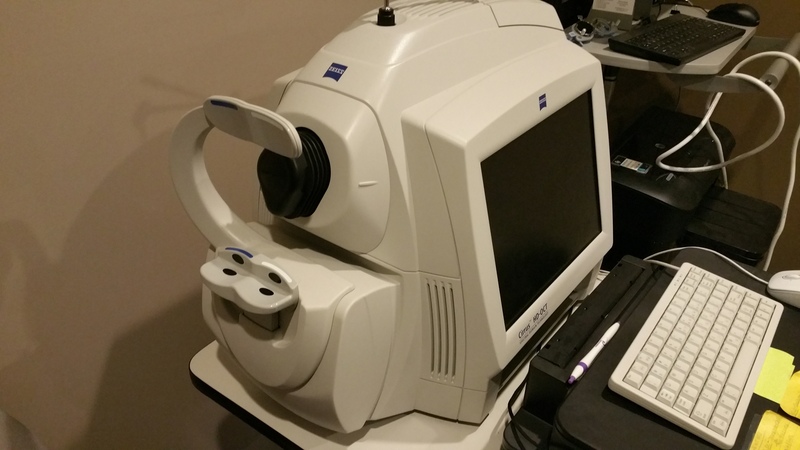 This can test can detect glaucoma BEFORE any vision is lost….and it doesn’t hurt! Is there a cure? 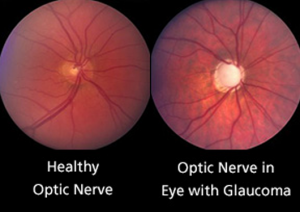 There is no cure for glaucoma, and there is no way to prevent developing the disease. However, the vision loss caused by glaucoma IS preventable. Glaucoma is treated by daily eye drops that lower the amount of pressure in your eyes which stops the damage to your optic nerve. There are surgical options available to treat glaucoma as well. Glaucoma Awareness Consider scheduling an exam if you haven’t had one in a while. Ask your parents when the last time they had an eye exam was and encourage them to schedule one if it hasn’t been done recently. To read more, visit www.glaucoma.org, our website, or call our office at 614-575-0111.